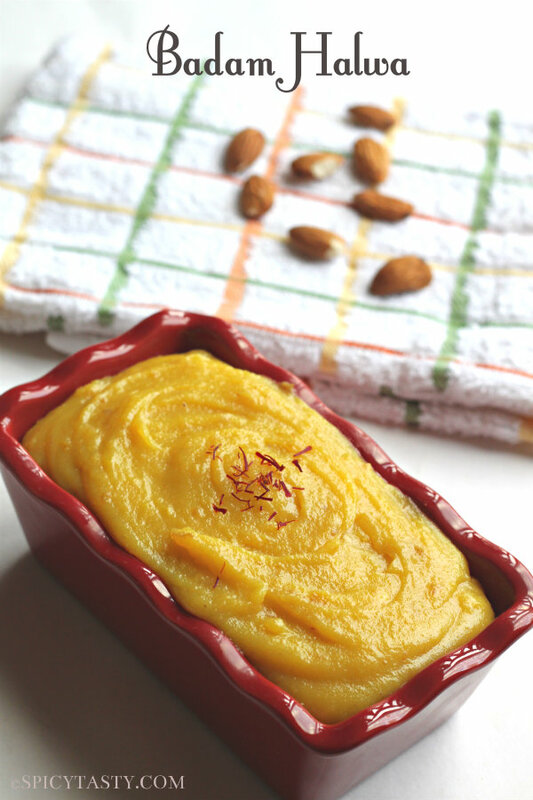 Badam (Almond) Halwa is one of the most popular and delicious Indian sweets and it is made with almonds, saffron, sugar and clarified butter. Diwali is coming up in a couple of weeks and if you are wondering what dessert to make, here is the richest, delicious and scrumptious Badam Halwa recipe. 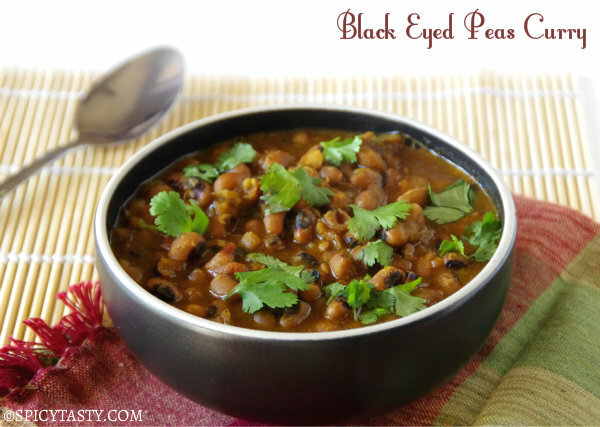 Try this recipe and you will definitely love it. Just as much if not more as I did. Soak Badam/Almond overnight or till the skin peel out of almonds when you press them with your fingers. Now remove the skin from almonds and grind it in blender by adding little milk to make a thick paste. 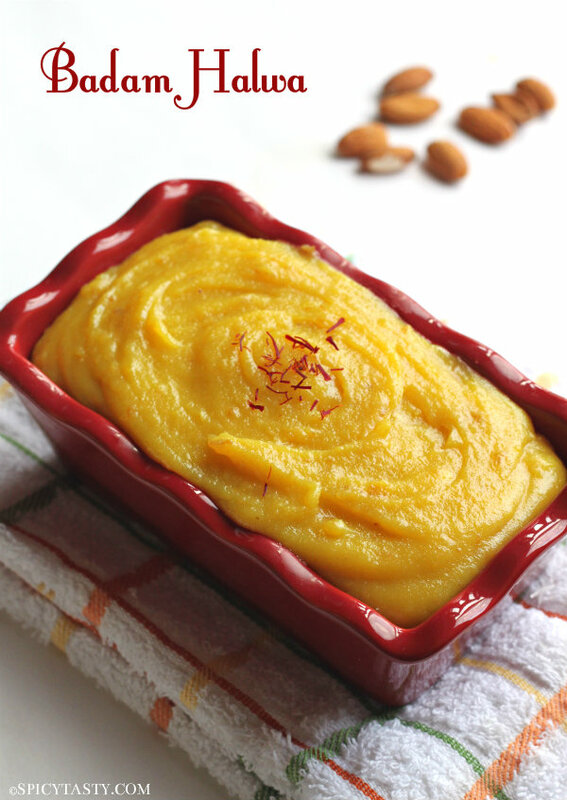 Keep the almond paste aside and heat milk with saffron in a wide pan (non-stick pan). Keep stirring the milk and once it comes to a full boil, add the sugar and keep stirring it. Let it boil for 5 minutes and then add the almond paste (keep stirring it otherwise it will burn in the bottom). Now add ghee little by little mixing it well in medium heat. 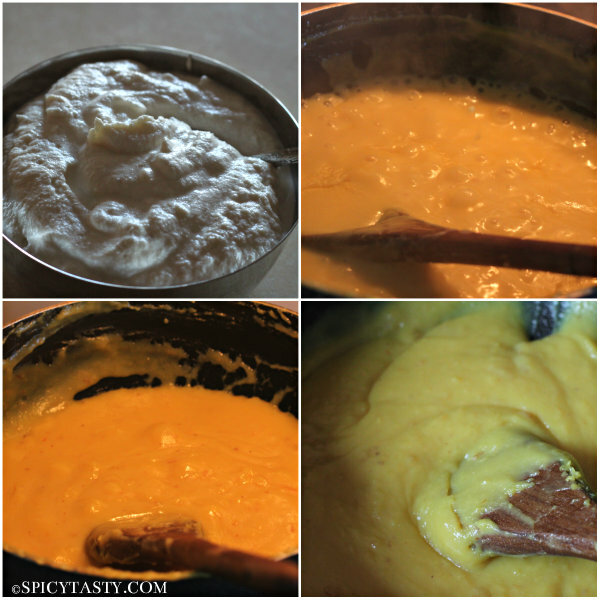 When you see the mixture gets creamy, add some more ghee and keep stirring it until you see bubbles and mixture gets really thick. This will probably take about 25-30 minutes. Now remove from heat and let it cool. It will come to it’s perfect consistency when it’s completely cool. 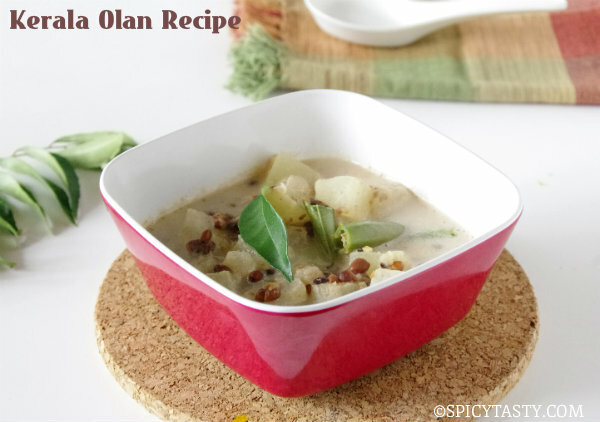 Garnish it with saffron and maybe some almond slivers and serve it. great looking dessert! love Almond in any form! Ohh yumm.. love that red dish too!